The best-selling and highly praised book counting 424 pages, eBook format, on fine art photography and black and white photography by Julia Anna Gospodarou and Joel Tjintjelaar. With a focus on architectural fine art photography and long exposure photography, but going far beyond these genres and covering black and white photography in general and in-depth. Everything about the artistic side, the practical side, the philosophical side but also the business of photography and the financial side of photography, plus… the secret to success in photography by Julia and Joel. You can consult this extensive BOOK PREVIEW (pdf) containing the Table of Contents and some fragments from the book to get an idea on what the book covers. Our black and white photography processing methods and workflow, our long exposure photography methods are analyzed in depth, with examples and extensive hands-on explanations, extended analysis of our award-winning images, plus the theoretical base for what we do so you do not only apply a method, but start creating your own black and white (en)Visionography right away. A book, written in simple English, so every lover of photography with a medium knowledge of the language, regardless where they are, can easily understand and use the information the moment they read it. As they say, great ideas do not need complicated words. We totally agree. 424 pages of extensive tutorials covering all aspects of B&W fine art photography, long exposure photography and architectural photography. Elaborate explanation on Joel’s B&W post processing using iSGM2.0 with luminosity masking and Julia’s Photography Drawing as an approach for B&W processing. Practical guideline to finding one’s own vision and a set of rules for what makes a good B&W photograph. An extensive explanation on (en)Visionography, a new thinking and approach towards photography in the digital age, described by its inventor Julia Anna Gospodarou. Extensive and detailed explanation on long exposure photography and composition techniques. …then Gospodarou (and Tjintjelaar) is the gospel!). I also started shooting some architectural images. Again I struggled to produce the results I had envisaged prior to capture. 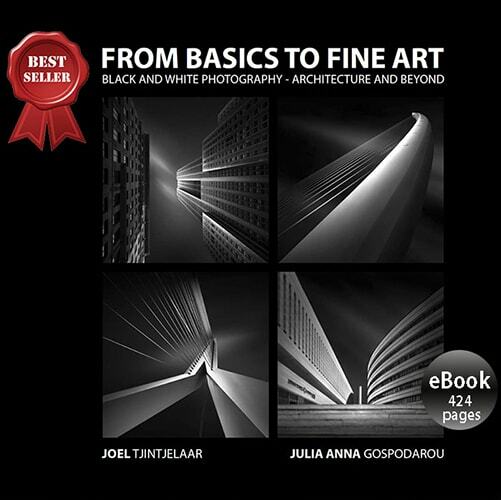 It was at this point, around mid-2016, that I read a review on ‘From Basics to Fine Art – Black & White Photography Architecture and Beyond’, an e-book co-written by the renowned photographers Joel Tjintjelaar and Julia Anna Gospodarou. I bought the book and read it over and over. It proved to be a turning point in my photography journey.